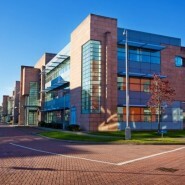 McCarthy & Associates were approached by Corporate Finance Ireland (CFI) to monitor the construction and fit-out of seven office blocks of various designs at Park West, totaling over 12,000 square meters. Two of these blocks were subdivided and all had multiple tenants. While monitoring the construction progress it became apparent that the main contractor was not performing in various areas, and would thus require to be replaced. The process of replacing this contractor delayed the construction of the development by 6 months after which construction resumed. During the initial construction, McCarthy & Associates suggested several amendments to the design which were subsequently implemented. As construction was ongoing, constant monitoring of the works took place to ensure the client’s needs were met. This included ongoing monitoring of the building plant equipment during the 6-month delay, to ensure it was protected from the elements and would not need replacement. Throughout the entire construction and fit-out process, frequent site visits were made. A detailed reporting process was implemented, ensuring that the client was aware at all times of the progress being made in line with the agreed programme. The client took ownership of the fully constructed buildings, which were in compliance with current building regulations, and also enjoyed an end product that was totally in keeping with the stipulated specification level and contractual agreement. All blocks have subsequently been successfully occupied by tenants.